10 Team Insight / January 2018 teaminsightmag.com TEAM / TRENDS B adger Sportswear's two late- 2017 acquisitions of Alleson Athletic and Garb Sportswear, cou- pled with Russell Athletic's earlier announcement that it would be exiting the team uniform business this year, certainly mark a reshuffling of power in the market in 2018. And these moves could only be the beginning of more dis- ruption in the next 12 months. The first shoe fell in early November when Badger Sportswear, the manu- facturer of athletic apparel and team uniforms, acquired Alleson Athletic, the family-owned supplier of in-stock uniforms and custom sublimated garments. The acquisition is com- plementary for both organizations. Badger specializes in fanwear, spirit wear and practice and workout apparel, while Alleson is a leader in team uniforms, including the Under Armour, NBA and New Balance brands. Badger CEO John Anton will lead the combined company and Todd Levine, president of Alleson, and his team, reporting to Anton, will continue to manage Alleson. "Both the Alleson and Badger brands have tre- mendous equity with our core customers, so we will continue to maintain, and invest in, both brands and their respective organizations," says Levine, pointing out the two companies have less than 15 percent overlap in their product portfolios. "The combined entity will take the Alleson brand to new heights that weren't possible as a standalone company." 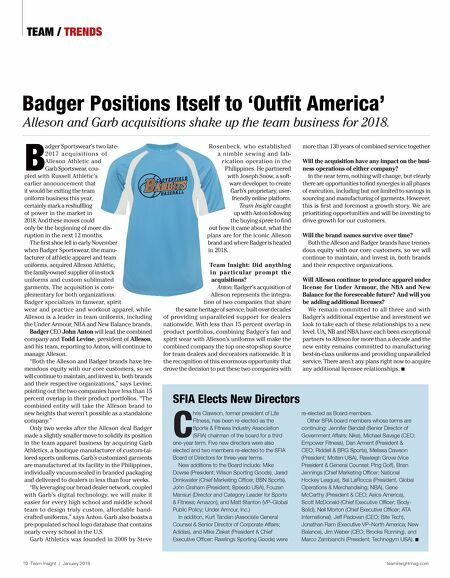 Only two weeks after the Alleson deal Badger made a slightly smaller move to solidify its position in the team apparel business by acquiring Garb Athletics, a boutique manufacturer of custom-tai- lored sports uniforms. Garb's customized garments are manufactured at its facility in the Philippines, individually vacuum-sealed in branded packaging and delivered to dealers in less than four weeks. 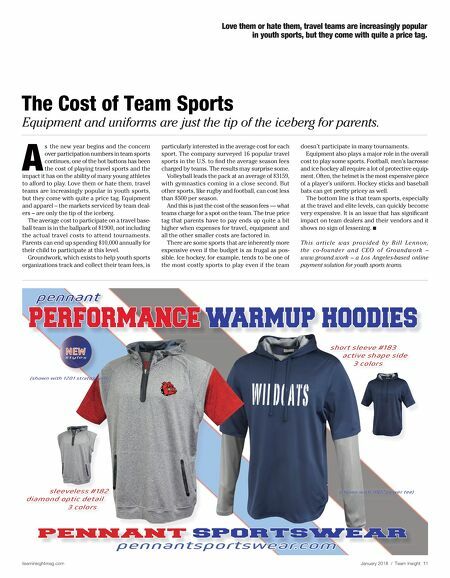 "By leveraging our broad dealer network, coupled with Garb's digital technology, we will make it easier for every high school and middle school team to design truly custom, affordable hand- crafted uniforms," says Anton. Garb also boasts a pre-populated school logo database that contains nearly every school in the U.S. Garb Athletics was founded in 2006 by Steve Rosenbeck, who established a nimble sewing and fab- rication operation in the Philippines. He partnered with Joseph Snow, a soft- ware developer, to create Garb's proprietary, user- friendly online platform. Team Insight caught up with Anton following the buying spree to find out how it came about, what the plans are for the iconic Alleson brand and where Badger is headed in 2018. Team Insight: Did anything in par ticular pr ompt the acquisitions? Anton: Badger's acquisition of Alleson represents the integra- tion of two companies that share the same heritage of service, built over decades of providing unparalleled support for dealers nationwide. With less than 15 percent overlap in product portfolios, combining Badger's fan and spirit wear with Alleson's uniforms will make the combined company the top one-stop-shop source for team dealers and decorators nationwide. It is the recognition of this enormous opportunity that drove the decision to put these two companies with more than 130 years of combined service together. Will the acquisition have any impact on the busi- ness operations of either company? In the near term, nothing will change, but clearly there are opportunities to find synergies in all phases of execution, including but not limited to savings in sourcing and manufacturing of garments. However, this is first and foremost a growth story. We are prioritizing opportunities and will be investing to drive growth for our customers. Will the brand names survive over time? Both the Alleson and Badger brands have tremen- dous equity with our core customers, so we will continue to maintain, and invest in, both brands and their respective organizations. Will Alleson continue to produce apparel under license for Under Armour, the NBA and New Balance for the foreseeable future? And will you be adding additional licenses? We remain committed to all three and with Badger's additional expertise and investment we look to take each of these relationships to a new level. UA, NB and NBA have each been exceptional partners to Alleson for more than a decade and the new entity remains committed to manufacturing best-in-class uniforms and providing unparalleled service. There aren't any plans right now to acquire any additional licensee relationships. Q SFIA Elects New Directors C hris Clawson, former president of Life Fitness, has been re-elected as the Sports & Fitness Industry Association (SFIA) chairman of the board for a third one-year term. Five new directors were also elected and two members re-elected to the SFIA Board of Directors for three-year terms. New additions to the Board include: Mike Dowse (President; Wilson Sporting Goods), Jared Drinkwater (Chief Marketing Officer, BSN Sports), John Graham (President; Speedo USA), Fouzan Mansuri (Director and Category Leader for Sports & Fitness; Amazon), and Matt Stanton (VP–Global Public Policy; Under Armour, Inc.) In addition, Kurt Tandan (Associate General Counsel & Senior Director of Corporate Affairs; Adidas), and Mike Zlaket (President & Chief Executive Officer; Rawlings Sporting Goods) were re-elected as Board members. Other SFIA board members whose terms are continuing: Jennifer Bendall (Senior Director of Government Affairs; Nike), Michael Savage (CEO; Empower Fitness), Dan Arment (President & CEO; Riddell & BRG Sports), Melissa Dawson (President; Molten USA), Rawleigh Grove (Vice President & General Counsel; Ping Golf), Brian Jennings (Chief Marketing Officer; National Hockey League), Sal LaRocca (President, Global Operations & Merchandising; NBA), Gene McCarthy (President & CEO; Asics America), Scott McDonald (Chief Executive Officer; Body- Solid), Neil Morton (Chief Executive Officer; ATA International), Jeff Padovan (CEO; Bite Tech), Jonathan Ram (Executive VP–North America; New Balance), Jim Weber (CEO; Brooks Running), and Marco Zambianchi (President; Technogym USA). Q Badger Positions Itself to 'Outfit America' Alleson and Garb acquisitions shake up the team business for 2018.